I don't like pie, but every so often I take a few bites just to see what the fuss is all about. Now that I eat gluten-free, I'm rarely pie curious. When I saw the title of the latest ebook Big Library Read, Art of the Pie by Kate McDermott I wasn't the least bit tempted until I read the subtitle, A practical guide to homemade crusts, fillings and Life. Intrigued by the pie/life connection, I clicked the download button. Even in electronic form this book is beautiful. The photography is stunning, and let's face it, pies can be pretty. The book is in story format, not page after page of (boring) recipes. 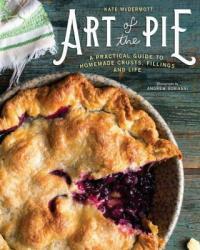 It is clear that Kate McDermott has mastered the pie art, and she explains every detail with engaging narrative. I didn't actually commit to the book until McDermott admitted that she was now gluten-free too. Her pie making changed from gluten-full (her term) to gluten-free. That gave me hope gluten-free baking might eventually transcend bitter bean flour, tasteless rice cookies and hard slab pizza crust. I enjoyed McDermott's stories about her journey as a pie maker, especially her tales of woe about awful school lunches, her red-plaid metal lunch box, and scary lunch ladies. I chose to read Art of the Pie on a whim, and I'm glad I did. It's a gentle read that almost inspired me to learn the art of gluten-free pie making. We are looking at ways to eat less meat and have more meatless meals. Eggs are kind of middle ground, since they are an animal product, but in our home, we'd consider an egg meal to be meatless. My other reason? We have a few laying hens, and sometimes I feel like the eggs on hand vastly out-number the ideas I have to use them. 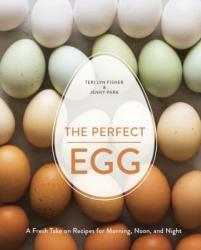 My hope with this book was to find some new ideas that would help me use our farm-fresh eggs in different, tasty ways. The book is beautifully photographed. Each recipe (with the exception of a few technique tips in the first chapter about things like boiling eggs) has a corresponding photo. Even though beautiful photography can be a setup for a 'Pinterest fail', I do appreciate the attention to detail and the gorgeousness of all the final products. The photographs help me decide which recipes might most appeal to my family. This book does include detailed recipes, but the authors also encourage you to make substitutions and adjustments here and there. This is how I cook all. the. time., so that resonates well with me. If you prefer to follow recipes exactly, you can, but I appreciate the....permission?....to take a recipe and make it my own. One thing I'm happy to tell you is that this book is not full of breakfast dishes...or strictly egg dishes. Sure, it has both, but it also has recipes that will work throughout the day. Some of the recipes are for breads, soups, and even some spreads - from mayonnaise to an egg butter. I found many recipes that are different from anything I've ever made or eaten, so I am happy with the scope. I like to try foods from various cultures, and this book offers many options in that regard as well. If you like to cook, if you like eggs in general, and if you're looking for new ideas and inspiration, then I think The Perfect Egg is the perfect place to get a little inspiration! I have gardened for a very long time. I grew up around gardens, and since I became a (supposed) grownup, I've almost always had one. These days, I find myself in a rather silly situation - five acres of land, but the deer have gotten so comfortable that I can't garden here...well, I can, but the deer eat all the food we grow. The only success I have these days is in enclosed spaces, but enclosing a space can get expensive. With some materials we had on hand, we have enclosed a small, 15x30 enclosure for gardening. 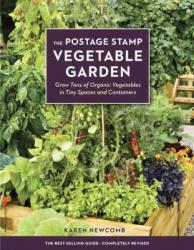 Enter the book, The Postage Stamp Vegetable Garden, by Karen Newcomb. It is written specifically for those gardening in tight spaces, including containers, flower boxes and small garden plots. I thought this book did a good and thorough job of explaining the process, yet I never felt bogged down by 'too much information'. I liked the information at the beginning of the book that provided some history about different forms of intensive gardening, and I like the way the book is organized through the seasons - preparation of site and soil, adding amendments and planting patterns that help you get the most from a small space, such as companion planting and inter-planting earlier and later crops. Ms. Newcomb even provides specific plant variety recommendations to increase the chances of success, as well as sources for the varieties she recommends. To me, the overall message of the book is that there are a few different ways to succeed. There are guidelines and suggestions, but no rigidity. If you can't get one soil amendment in your area, there are suggestions of others that will have similar effect. If you want to start your own seedlings, the information is there, but there are also some tips for purchasing ready-to-plant seedlings. There are multiple layout ideas - none of which I would use precisely as shown, but all of which help illustrate the author's suggestions that you plant taller plants to the north (so they don't shade shorter plants), etc. I like this book, and I appreciate the flexibility it embraces. Having gardened a long time, I have used different methods in different locations with varying results, and I think the author did a good job of presenting small-scale, intensive gardening in a broad and informative way.